Apple is making its camera capable of shooting higher-resolution videos. Rumors indicate that 2018 autumn new iPhone XR/XS(Max) will pair a 13-megapixel camera. If it comes true, users will enjoy super clear videos, yet feel the pain: the size is way big. Leave that aside, the current 4K 60fps videos are already causing headache. In many cases, users may find the iPhone videos are too large to be sent or uploaded; even the HEVC can cut half the size. Well, we need to compress iPhone videos for email, YouTube, Whatsapp and more. But how to reduce iPhone video size without losing quality? Compress iPhone videos by 40%-70% without losing quality! 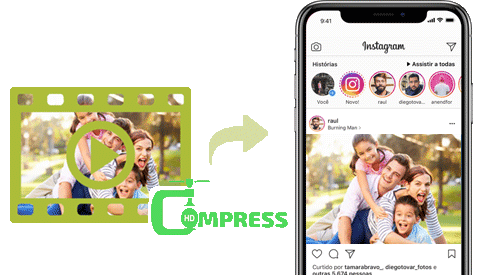 Must-have iPhone video compressor can shrink iPhone video at amazing high reduction (400MB 4K 60FPS iPhone video to 15MB) without noticeable quality loss by transcoding to better format, adjusting the video resolution, bitrate, frame rate, and crop or trim the length of video. How Big is an iPhone Video? Now iPhone SE, 6S and later models are able to record videos at 4K 30fps (iPhone X and 8 allow 4k at 24fps and 60fps). There are also shooting options at 1080P and 720P. The higher resolution means larger file size. Also the higher frame rate ensures smoother video but takes more storage space. Check the space of each iPhone video. Let's do a simple math: if we take a 10-minute video in 4K at 30fps, the file size goes up to 1.7GB when HEVC format is applied. Is that size too big? Not really if you store it on today's 64-GB iPhone 8, but in more cases, you will need to reduce file size of iPhone videos. With YouTube, you will be able to upload a maximum size of 128GB, but you're out of luck with others. Due to the bandwidth speed and storage demands, tight size limitations exist almost everywhere in our life, no matter when you upload them to FaceBook, Whatsapp, or send your iPhone recordings to friends via emails. Let's have a look at the most common video size limits that we may meet in our life. FaceBook: FaceBook video uploads are limited to 4GB or 120 minutes. Whatsapp: Only 16MB is allowed to be sent via Whatsapp. Twitter: Video size can't exceed 15MB (sync) or 512MB (async). Instagram: Videos within 4GB and 60 seconds are allowed to be uploaded. Email: It depends on different Email services. E.g., Gmail allows 25MB, while Hotmail can send a maximum size of 10MB. Conclusion: Apparently, one minute iPhone video at full HD 1080P (130MB) easily exceeds the size limits of many common services, let alone 4K ultra HD iPhone videos. Even with the 128GB high capacity of YouTube, the internet speed is another issue to consider. For example, when you upload a 4K 500MB video to YouTube, it takes 21 minutes, while only 5 minutes are used to upload the same video shrinked to 1280P 100MB. Let's face it: we need to keep the iPhone video at a smaller size. So is there a way to compress iPhone video size without losing quality. The best output results, namely smallest size yet highest quality, are heavily depends on the compressor to be used to reduce the videos from iPhone. Also, the HD & 4K UHD resolutions should also be taken into account, considering that many apps freezes and gets stuck with 4K videos. 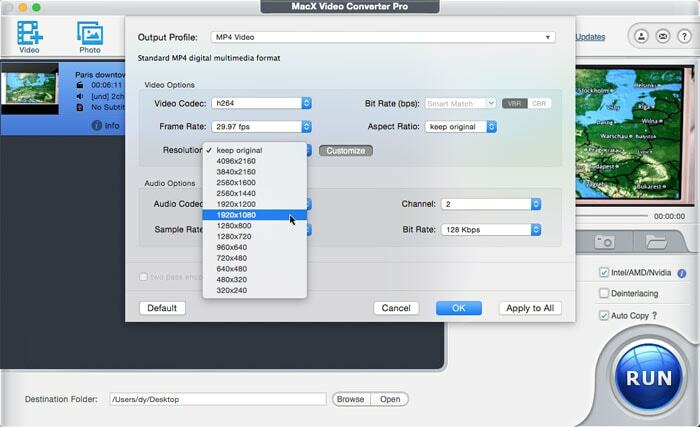 With the two requirements in mind, the HD video processing tool MacX Video Converter Pro is a must-try. It shrinks large-size H.264 videos to HEVC with 50% smaller size, as well as convert 4K HEVC, H.265 iPhone videos to smaller formats like FLV, WMV, RMVB, 3GP, VP9 as well as 370 more formats. There flexible parameter options to change the bit rate, lower the resolutions from 4K to 1080P etc. The High Quality Engine and Auto Copy ensure the best possible quality- 98% quality reserved. The editing features offers lossless compression for iPhone videos: crop the unwanted parts from the screen, cut the extra commercials and segments from the video. All the above methods can reduce the iPhone video size by up to 40%-70%. The world's unique Intel/Nvidia/AMD GPU hardware accelerations deliver the world's fastest speed to process & compress iPhone 4K/HD videos. It remains 5 to 8x faster than others. How to Compress iPhone Videos without Losing Quality? To get start, first free download the iPhone video compressor software on computer. Step 1: Connect iPhone to computer and export the iPhone videos to be reduced. You can do this via iTunes sync, or any other third-party helper. Then launch the program. Important note: to allow the fastest video editing & processing speed dealing with 4K UHD, HD 1080P and 720P videos, make sure you have checked the hardware acceleration Intel/Nvidia/AMD box on the interface. Step 2: Click Video button with a + icon to load the iPhone videos. A window will pop up asking you to choose the output video format. If the iPhone video is in H.264 4K, 1080P or 720P, to convert H.264 to HEVC H.265 can save 50% file size. If the iPhone video is recorded in HEVC, you can select small-size video format like FLV, WMV or 3GP. Note: HEVC is not widely accepted by far. For example, HEVC is not accepted by many major social sites & services like FaceBook, Vimeo, Whatsapp, Instagram (YouTube does support HEVC H.265 format) or Android, Windows phones, other devices. So if you're compressing iPhone videos for platforms that won't support HEVC, choose other small formats. * Bit rate - Bit rate is directly related to video file size. Lower the bit rate will significant reduce the final size. But don't get greedy, lower bit rate also means worse video quality. * Resolution - Larger resolution will require more bitrate to keep the same level of quality, and therefore, influence video size greately. For example, if you compress 4k to 1080P, the size will be reduced by 20%-50%. If the final videos are going to be played on mobiles or small screens, feel free to adjust the resolution as you won't notice the differences. Or adjust to one level below the original resolution like 1080P to 720P. * Frame rate - Basically, frame rate has no effect on the file size. But, when you're trying to shrink a very large iPhone video, reduce the frame rate will also help to shrink the size by a little bit. For example, switching 60fps to 30fps may lead to 10% size decrease. Plus, lower frame rate won't make any difference on small screens, but will on big ones. * Trim - Sure the longer the video is, ther large it will be. By setting the start time and end time, you can cut out the unncesscary parts and only maintain your favorite segments. * Crop - Click Expand & Crop, then Enable Crop to remove the unwanted black bars. Step 5: When everything is ready, click Run and the editing will implement all the adjustment to the video. Via the above measures, it offers a video size decrease at up to 40% to 70% based on the source video. For example, when compressing an iPhone video in MP4 H.264 AAC 3840x2160, the original video size is reduced by up to 80%, from 504MB to 100.6MB. The whole process is finished quickly within 4 minutes with the help of hardware accelerations. As for the output quality, no quality difference is obersved. About 98% original quality will be reserved with the advanced High Quality Engine. 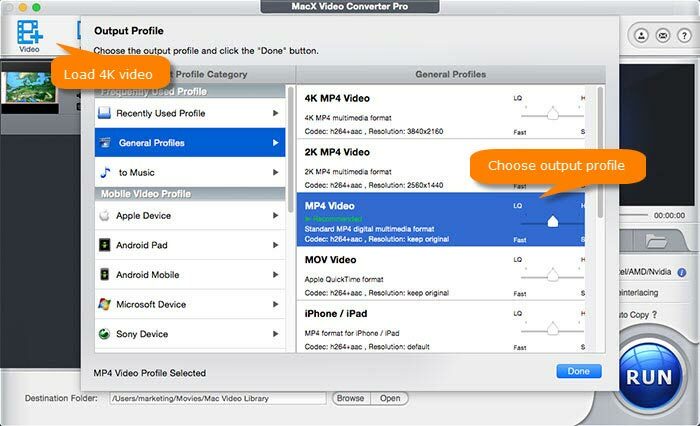 MacX Video Converter Pro will easily shrink video for YouTube, Whatsapp, FaceBook, Email etc without losing quality by converting video to smaller codecs like HEVC, WMV, FLV, 3GP, lowering resolution under 1080p, downscaling frame rate to 30fps or lower, cutting down videos no more than 60 seconds etc. Reduce HD or 4K UHD video size with top quality for YouTube. Gigabytes of videos to email size limits possible? Check now. 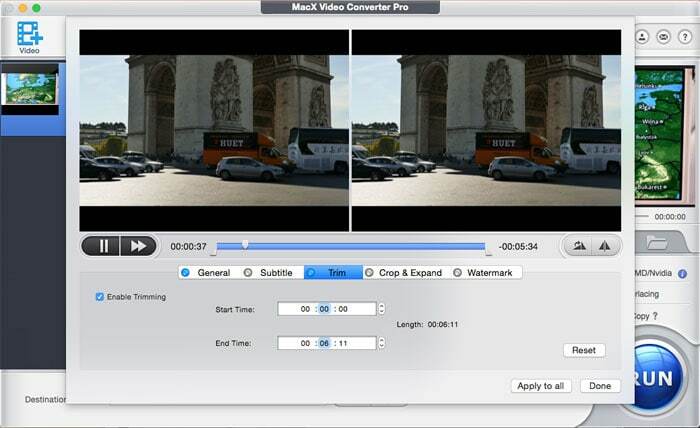 Must-have video shrinker for Mac to reduce size by up to 70%.